Here I am, in Buenos Aires, with a red and blue sunset, with thousands of things to do and thousands of things done, drinking whiskey and probably, when the night comes, a Lexotanil to lower my anguish. I've thought about you everyday; I miss you very much. What are you doing? Hello Fabián. I'm eating a pear. They removed my gallbladder. They also found a big calcium stone in the pancreas. They tell me that chronic pancreatitis is what I have. As for that stone, I'm going to take care of it somehow later on. I'm going to ask it to go away. They tell me that, at present - maybe forever - I can't drink alcohol, and there are a lot of things that I shouldn't eat anymore. Almost everything that I like. Cheese, almonds, avocados, seafood, chocolate, coffee, egg yolks, croissants and all the pastries, everything fried, and lots of other food I've been used to ingesting since childhood. The idea is that if I stop taking in fats, alcohol and tobacco perhaps the stone will be reduced - what do I know? I don't know if that will be how it leaves my body. I think I should talk to the stone. I hadn´t realized the quantity of chocolate and wine I consumed daily. 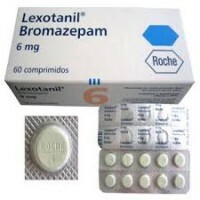 I went to the doctor for a full physical examination, as it was years since the last one. They said I have everything very healthy - pulse at 44 beats per minute, good low blood pressure, the brain of a 25 year old guy, no indication of cancer, nothing bad, nothing physically wrong. Except that, in the images they did of my abdomen, they saw that I had a lot of little stones in my gallbladder, as if it were filled with gravel. After removing my gallbladder, the guy asked me if my pancreas hurt me very much. "No, not at all," I said. "There are people with much smaller stones who ask me for morphine," he told me. I was in a state of shock. Where the hell did that rock come from? Well, anyway, I've already gotten used to not drinking alcohol. And to eating differently. I realized that every day I had some whiskey and wine. I miss the habit of stopping at any bar to order a drink to accompany the reading of newspapers and books, to accompany the conversation with neighbourhood acquaintances and strangers, but I do not mind so much the absence of alcohol. I can drink water, revolutionary concept! Now I have to quit tobacco completely. That is going to be more difficult. I don't know if I will quit drinking maté. I already feel better, with more energy, so maybe the change is good. 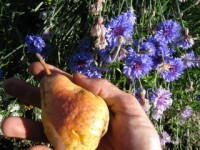 A pear from my orchard. Last night I had such a good and bad time watching the match against Banfield in the Copa Sudamericana tournament. It was one of the most memorable and enduring comebacks for our club in recent years. The second goal, the result of a tremendous collective play, brought to mind the origin of the nickname CICLÓN; the third one, a galloping scissor kick, by Cauteruccio, and the penalty save that Cóndor Torrijo did at almost 89 minutes into the match almost killed me. To be a Cuervo is an honour, a mortal wound. I was teaching classes and later I left to get my suitcases ready to travel to Colombia where I'm going to a book fair. I read about the match in the newspapers today. It seems it was tremendous. Have a good trip, brother. I hope everything goes well for you, that you sell a lot of books and have a good time, too. Yes, it was a tremendous match, with a storybook ending. And last night I saw another heart-stopping match here in Madrid. They invited me to Bernabeu to see the first match of the Champions of Real Madrid against the Sporting Lisbon, Cristiano Ronaldo's old team (and Beto Acosta's!). Zidane´s team didn't play well, but the champion in them showed up with one of those epic comebacks for which that stadium is so famous, with a tying goal by CR7 [tr. note: Ronaldo] at the 88 minute from a free kick and the victory in the last seconds of extra time, at minute 93, by Álavaro Morata, the home-grown Madrid player who triumphed in Juventus and now has come home. Great assist from James, who is returning to form little by little. Have you read Bohumil Hrabal? He's a great writer. I just read Too Loud a Solitude. It's about a guy who has the job of shredding old books and reproductions of paintings. From time to time he keeps some of the works or remembers something that he read years ago, fragments of poems, phrases from Hegel, Kant, Nietzsche, Lao Tzu, the great Greek and Roman philosophers - from any genius of literature or philosophy - comparing the images of painters and poets with the grey and miserable world in which he lives. Hrabal wrote this beautiful book during the Communist era in Czechoslovakia, during which his work was banned by the totalitarian regime of the pro-Soviets. The prose is a marvel, full of metaphors, a fable about love, creation and destruction. It's a cry from loneliness, a fight against ignorance and censorship, a flower that grows in a rotten cellar, a forceful Yes to life in spite of all the misfortunes that it brings us. Speaking of that era, I don't know if I told you that a few months ago, I saw a beautiful exhibit by the Czech photographer Josef Koudelka. He once said something very simple: "A good photo is one that you can't forget." His photos of gypsies are great, but the ones that moved me the most were the ones that he did during the confrontation between the people in the street and the Soviet invaders and their tanks in 1968, called the Prague Spring. Yes, I read that book by Hrabal a long time ago; he's great. I'm at the airport waiting for a rescheduled flight to go on tour with the books around Bogotá, Cali and Medellín. Pilots' strike, but it seems I'm leaving at two in the afternoon; it had to be at noon. I've rented an apartment two blocks from the kids. They are giving it to me at the end of the month. Now it's the fakir's way for me. The brain uses the anguish to keep you in comfort zones. Today I saw Paul McCartney jumping into a swimming pool fully clothed and he´s 24 years older than I. It cheered me up. The play that I wrote already began rehearsals and I hope to do it in a Boedo theatre. I love you. And you got to the airport early, didn't you? How nice that the play is being rehearsed by actors in a theatre. I like what you wrote; it breaks moulds and is provocative. Will you attend rehearsals? I'm sure you'd like that, when actors and director have taken on the play and feel comfortable, that you should go and see how it sounds when everything is put together. I think that you'll be able to jump into the swimming pool with clothes on or off when you are a 100 years old. I'll join you in that event. I read a (true) story about a woman who kidnapped, prostituted and killed children in Barcelona at the beginning of the 20th century. Horrible. She made creams from the children's bodies and sold them to wealthy people. Her clients didn't know what the creams were made of; they simply believed that it would cure them of every sickness and rejuvenate them. It's insanity, the human race - a toxic mixture of high tension and cruelty. That Catalan killer was named Enriqueta Martí. By the way, I spoke with another doctor who tells me that I can drink wine now and then (only red) and maté and other things, too. That's better. Hello brother. I'm here in Medellín about to travel to Caliwood, land of Andrés Caicedo. I'm keeping it together with Lexotanil and firewater since the ghosts of the separation that removed me from the kids' realm hurts my soul. I had dinner with several writers who are here and who are also from the Separados Soccer Club [tr. note: Separated Soccer Club], and they told me that this will hurt for a year or more. I have to move toward Buddhism and sit down beneath the meditation tree to see what I can do. Yesterday I tried to see the San Lorenzo- Vélez match, but it wasn't on TV. Be careful with eating; maybe a diet that eliminates flours and things like that would give you a boost. Still I think you're made of iron. I knew it the freezing night that we filmed the scenes of the kidnapping of your daughter in Jauja and you were in pyjamas and barefoot. I know a little about what you're telling me, brother. When Exene and I separated it was hard and sad and some of that remains forever. Luckily we could keep talking and being good friends, she and I, like you and Guadalupe. But it's also true, as your friends in Buenos Aires are telling you, that you get used to it, like Manco Casa got used to playing and not playing soccer, living his life according to what was possible without his right arm. Well, all wounds are fatal, right? I miss you. I will call you when I get home in half an hour. We defeated Vélez well. It could have been much worse for the Fortineros [tr. note: Vélez]. The 2-1, like the recent 2-1 by Guardiola´s Manchester City against Mourinho´s Manchester United, seemed as though it was going to be a shameful thrashing. In these two matches, the first half was a dancing lesson by the Cuervos and the Citizens. Neither Vélez or Mourinho seem to be very clear about what they want to play. Aguirre has won the team's trust, and he's laying out the matches well. San Lorenzo is playing nicely and has the wind in its favour in the Copa Sudamericana, the Copa Argentina and the local tournament. Let's enjoy it, brother. Now here I am in Caliwood, understanding why Andrés Caicedo committed suicide so young: it´s very hot. 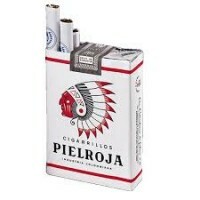 I´m smoking Pielroja cigarettes. Yes, Blanco's goal was a poisoned kick. And I loved how they combined Mussis, Belluschi and Cauteruccio against Vélez. The victory with another goal from Blandi (who's being impossible of late), assisted, of course, by Blanco. Playing like this, San Lorenzo can make any team in the world suffer. I don't know if you saw it, but we didn't play very well against Patronato yesterday. They did their best to leave with three points, so you could say that we escaped with a tie. We have to be grateful for the point that kept us in the fight. San Lorenzo´s match was an anomaly; the Cuervo way of playing wasn't fluid. But the team didn't completely fall apart either. Sometimes there are matches like that, days like that. Hold on Ciclón! There's so much left to play on all fronts. Once more Torrico saved the 1-1 by stopping a penalty shot. When are they going to call him for the National Team? Between the goal posts, the Cóndor is the best there is with an Argentine passport. We are still there, in the struggle for it all. In the second leg against the Venezuelan team La Guaira, we can secure qualifying for the quarter finals in the Copa Sudamericana. In the Copa Argentina, CASLA will play against Tomba [tr. note: Club Deportivo Godoy Cruz] to try to get to the quarter finals. I look at the picture of the Final Round of that tournament and I see that we are advancing; a semi-final against River and a final against Boca could happen. I hope so, because we are ready to shut the mouths of the Gallinas [tr. note: River] and the Bosteros [tr. note: Boca] this year. And in the tournament for the First [Division], we are four points from the top and playing very well. Blandi is scoring goals of all kinds, in almost every match. Let's hope his good streak continues. I've just finished reading a very good biography about a writer I've always liked, Mari Sandoz. Daughter of a Swiss pioneer, she was born in the northwest of the state of Nebraska in the late 19th century, right after the final defeat of the Lakota of Tasunke Witko (Crazy Horse,) the native people who most resisted the invasion and conquest of the West by the US army, and the gangs of miners and other armed opportunists from the urban centres of the Atlantic side of the country. Sandoz endured being rejected a thousand times by different publishing houses, but she was very stubborn and sure of her talent. Time proved her right, and New York's provincial critics ended up respecting her way of writing her dialogue in the regional slang of the plain, and her meticulous work as a historian to faithfully represent the habits and lifestyle of native peoples. Mari grew up surrounded by the Lakota, the Cheyenne and the stories and legends of those tribes. She learned a lot from it all, and from the arid, sandy landscape of the Sand Hills, an area in the west of Nebraska bordering Wyoming and South Dakota. Her writings are songs to the beauty of the Far West plains and the endurance of their native peoples and also of the European pioneers. She's the author of the best biography written about Tasunke Witko, a book called Crazy Horse: The Strange Man of the Oglalas. I´ve adapted her book, The Horsecatcher. I´d like to turn that script into a film.